Initially, the terms "Syndrome X" and "microvascular angina" were used interchangingly. Now, it is clear that "Syndrome X" includes all patients of angina with normal coronaries on angiography. "Microvascular angina" is a specific subset of patients where coronary microvascular dysfunction is demonstrated. Coronary micro vessels include prearterioles, arterioles, and capillaries. These vessels are not directly visible on coronary angiography or on other modes of scanning. Diagnosis is based on the combination of classical angina, evidence of myocardial ischemia on electrocardiogram or stress test, normal coronary angiogram, exclusion of spasm of epicardial coronary arteries, and coronary flow reserve 2.5 or less. Because of interchanging use of these terms, there is a significant overlap in literature regarding management. 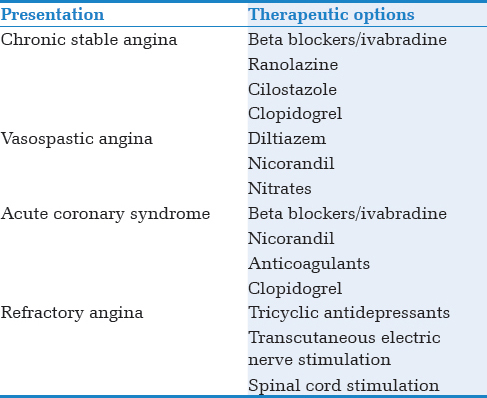 It is not clear if management options found useful in "Syndrome X" will be equally effective in "microvascular angina." Present review provides an overview of literature. We have specifically used the term used by various authors. Many of the known risk factors associated with coronary microvascular dysfunction are similar to the risk factors for obstructive epicardial coronary artery disease. Coronary microvascular dysfunction is associated with impaired flow mediated vasodilation of peripheral vessels, progressive involvement of epicardial coronaries, and higher incidence of stroke on follow-up. Betablockers reduce heart rate, cardiac contractility, and blood pressure, thus reducing myocardial oxygen demand. These drugs are, therefore, also effective in coronary microvascular dysfunction. Betablockers are more effective in patients with increased adrenergic drive as manifested by resting tachycardia, disproportionate tachycardia at low work load, coexisting anxiety, and hypersensitive heart. It reduces the rate of sinoatrial node by selectively inhibiting if current. It is useful in patients where beta blockers are contraindicated or not tolerated. Skalidis et al. observed significant improvement in hyperemic coronary flow velocity and coronary flow reserve in nonculprit vessels in patients with stable coronary artery disease indicating improved microvascular function. Villano et al. observed that ivabradine improved the quality of life when given in addition to standard anti-ischemic therapy to patients of microvascular angina. However, there was no significant effect on time to 1 mm ST segment depression, exercise duration, coronary microvascular function, and flow mediated vasodilation. These agents prevent microvascular spasm and are the first choice in microvascular spastic angina. They also reduce resting tone of microvasculature and therefore, may benefit some patients of stable microvascular angina, especially those with additional rest angina or variable threshold effort angina. Sublingual nitrates are effective in relieving angina only in 40-50% of patients of syndrome X. It is attributed to the lack of any significant effect of nitric oxide on coronary microcirculation except at the level of prearterioles. Long acting nitrates have not been found to be effective in reducing episodes of angina in patients of syndrome X.  Sublingual nitrates do not have any significant effect on exercise stress test in patients of microvascular angina. On the contrary, there may be a significant worsening in exercise duration and time to 1 mm ST segment depression. This is likely to happen in patients with fixed (rather than dynamic) narrowing of coronary microcirculation. Failure of dilation of diseased coronary microvessels with dilation of normal vessels resulting in 'steal' phenomenon could contribute to deterioration. It opens ATP sensitive potassium channels thereby dilating peripheral and coronary resistance arterioles (part of microcirculation), unlike nitrates which dilate only epicardial coronaries. It also possesses a nitrate moiety and therefore also dilates systemic veins and epicardial coronary arteries. In one small short-term study, 5 mg given 3 times a day for 2 weeks moderately improved exercise induced ischemia in nine out of thirteen patients with microvascular angina (coronary flow reserve <3). Nicorandil treatment has been shown to significantly decrease incidence of angiographical "no reflow" after reperfusion in patients with acute myocardial infarction and incidence of "slow flow" phenomenon following percutaneous coronary intervention. "Slow flow" and "no reflow" are angiographic signs of coronary microvascular dysfunction. Sulfonylurea's eliminate the effect of nicorandil by inhibiting the opening of K-ATP channels and should not be co-administered. About 100 mg of sildenafil has been shown to significantly increase coronary flow reserve in women with coronary microvascular dysfunction. Co-administration with nitrates can produce significant hypotension. Niacin has direct effects on vessel wall at the level of endothelium and vascular smooth muscle. Prolonged release niacin (up titrated to a maximum dose of 1500 mg/day given for 12 weeks) improved peripheral small artery vasodilatory function and compliance in statin treated type 2 diabetic patients with endothelial dysfunction. It has not been evaluated in coronary microvascular dysfunction. It is a rhokinase inhibitor. It inhibits calcium influx in vascular smooth muscle cells thereby reducing myosin light chain cross linking. Intracoronary fasudil has been shown to prevent acetylcholine-induced microvascular spasm. It is not clear if oral therapy will be effective in angina due to coronary microvascular spasm. Losartan and telmesartan have been shown to have protective effect against vascular remodeling in stroke prone spontaneously hypertensive rats. Losartan has been shown to increase microvascular recruitment in muscles in rat model. There are no studies on coronary microcirculation in humans. Reriani et al. evaluated effect of endothelin A-receptor antagonist - alrasentan on coronary endothelial function in patients with early atherosclerosis. Coronary blood flow response to acetylcholine significantly increased after 6 months. Tadalafil has been shown to improve peripheral microcirculation in Raynaud's phenomenon. It has also been shown to modulate microvascular recruitment in diabetic postmenopausal females. It may be beneficial in coronary microvascular dysfunction. It is a selective phosphodiesterase-3 (PDE-3) inhibitor. By inhibiting PDE-3, it inhibits the breakdown of intracellular cyclic adenosine monophosphate (cAMP). Increased concentration of cAMP in vascular smooth muscle promotes vasodilation. It also inhibits vascular smooth muscle spasm. About 100 mg BD has been shown to be effective in vasospastic angina not controlled by calcium channel blockers and/or nitrates. It has not been evaluated in patients with coronary microvascular dysfunction. It is expected to be beneficial in coronary microvascular spasm. It lowers blood viscosity and improves erythrocyte flexibility. It is expected to improve microcirculation in patients with fixed narrowing of micro vessels. Oral anticoagulants, low molecular weight heparins, factor Xa inhibitors (e.g., fondaparinux) can improve flow through narrowed micro vessels. Clopidogrel has antiatherosclerotic potential via its antioxidant and anti-inflammatory properties. It has been shown to improve microvascular endothelial function in subjects with stable coronary disease. This effect is independent of effect on adenosine diphosphate-induced platelet reactivity. These drugs may be beneficial in patients of coronary microvascular dysfunction presenting with acute coronary syndrome. It inhibits late sodium current associated with ischemia thereby inhibiting consequent calcium overload and resultant diastolic stiffness. Decreased diastolic stiffness decreases diastolic compression of intramural vessels resulting in increased late diastolic coronary flow. About 500-1000 mg BD improved angina in women with evidence of ischemia but no obstructive coronary artery disease. Villano et al. observed improvement in the quality of life, time to 1 mm ST segment depression, and exercise stress test duration by ranolazine (375 mg BD) in patients with microvascular angina. However, there was no effect on coronary microvascular function (response to adenosine and to cold pressor test) and on peripheral endothelial function (assessed by flow mediated dilatation). Tagliamonte et al.,  however, observed significant increase in coronary flow reserve following 8 weeks treatment with 500 mg BD of ranolazine. It is useful in patients of coronary microvascular dysfunction refractory to conventional antianginals. It shifts the cardiac metabolism form fatty acid oxidation to glucose oxidation during ischemia. It is likely to provide symptomatic relief in coronary microvascular dysfunction. A small, placebo controlled, trial has shown improvement in time to 1 mm ST segment depression and total exercise time. However, there was no significant reduction in exercise-induced ST segment depression. These drugs inhibit visceral pain probably by inhibiting reuptake of serotonin and norepinephrine. Imipramine (50 mg/day for 5 weeks) reduced the episodes of chest pain in patients of syndrome X. This dose was, however, associated with high incidence of side effects with the result that there was no improvement in overall quality of life. It is based on the concept that activity in touch fibers in the periphery can inhibit ongoing transmission of pain at the level of spinal cord. Low voltage electrical painless impulses are delivered through electrodes on the skin overlying area of angina. de Vries et al. have observed reduction in pain and nitroglycerine consumption and increased exercise capacity and walking distance in patients with refractory chest pain and normal coronary arteries. Telmesartan and olmesartan have been shown to improve microcirculation among hypertensives. Olmesartan is more potent in controlling hypertension and reducing inflammatory markers. From microcirculation perspective, dual blockade is no more beneficial than a monotheraphy approach with either class of agents, especially given the increased risk of renal insufficiency, hyperkalemia, and hypotension. Proper control of diabetes reduces rate of cardiovascular events in patients with epicardial coronary artery disease. This should be equally true for coronary microvascular dysfunction. Exerts anti-inflammatory effect, restores endothelial function, improves vasodilation, and improves fibrinolytic profile. It is not clear if these effects are independent of glucose lowering effect. It has several intrinsic effects on microcirculation which are independent of the glucose lowering effect and are observed at doses below the doses used for management of hyperglycemia. Jadhav et al. evaluated the effect of 8 weeks therapy with metformin (500 mg BD) in nondiabetic women with a prior history of normal coronary angiography. Maximal ST segment depression and chest pain incidence improved as compared to placebo recipients. Coronary microvascular functions were not evaluated. These improve endothelial function. They have been shown to increase exercise duration and time to >1 mm ST segment depression during stress test in patients of cardiac syndrome X. Combination of fluvastatin (40 mg/day) and diltiazem (90 mg/day) has been shown to have more pronounced effect than either drug alone. Statins have been shown to increase coronary flow reserve in patients with slow coronary flow. Statins also have anti-inflammatory and antioxidant property and may be beneficial in patients with elevated C-reactive protein and other markers of inflammation. It has been shown to improve endothelial function in statin treated type 2 diabetic patients. It may be beneficial in coronary microvascular dysfunction in diabetics with hypertriglyceridemia. Adenosine is a major mediator of cardiac pain. Its enhanced release from ischemic areas could contribute to increased pain sensation in microvascular angina. Xanthine derivatives; e.g., aminophylline, block adenosine-receptors. Acute (6 mg/kg given intravenously over 15 min) as well as chronic oral (325-350 mg BD) administration of aminophylline have been shown to improve angina and exercise capacity in patients of syndrome X. However, there was no effect on peak exercise ST depression and frequency and duration of ST segment depression during Holter monitoring. Exact status in isolated coronary microvascular dysfunction without chronic obstructive airway disease is not clear. Various trials have revealed conflicting results. Most of these studies have used the combination of conjugated equine estrogen and medroxyprogesterone acetate, which is suspected to abolish the beneficial effects of estrogen on microcirculation. Knuuti et al. observed that combination of estradiol (1 mg) and drospirenone (2 mg) for 6 weeks significantly increased myocardial perfusion reserve in postmenopausal women with angina pectoris. It has significant potential  and needs evaluation in documented coronary microvascular dysfunction. Low intensity special acoustic waves are given to the border of ischemic area under echocardiographic guidance. It is expected to trigger angiogenesis in viable myocardium. It has been shown to be safe and effective in management of refractory angina. Randomized double blind, sham controlled trials are required to find role of this procedure in coronary microvascular dysfunction. Proposed plan of management is shown in [Table 1]. Management of coronary microvascular dysfunction is challenging. Several therapeutic options have been tried with variable success. Life style modification and management of risk factors and comorbidities is essential. Drugs can be selected depending on clinical presentation and expected etiopathogenesis [Table 1]. Stem cell therapy, gene therapy, and extracorporeal shock wave myocardial revascularization are under evaluation. Well designed, long-term trials enrolling adequate number of documented cases, and properly selected control group are likely to give more precise information. Skalidis EI, Hamilos MI, Chlouverakis G, Zacharis EA, Vardas PE. Ivabradine improves coronary flow reserve in patients with stable coronary artery disease. Atherosclerosis 2011;215:160-5. Villano A, Di Franco A, Nerla R, Sestito A, Tarzia P, Lamendola P, et al. Effects of ivabradine and ranolazine in patients with microvascular angina pectoris. Am J Cardiol 2013;112:8-13. Cannon RO 3 rd , Watson RM, Rosing DR, Epstein SE. Efficacy of calcium channel blocker therapy for angina pectoris resulting from small-vessel coronary artery disease and abnormal vasodilator reserve. Am J Cardiol 1985;56:242-6. Lanza GA, Colonna G, Pasceri V, Maseri A. Atenolol versus amlodipine versus isosorbide-5-mononitrate on anginal symptoms in syndrome X. Am J Cardiol 1999;84:854-6, A8. Lamendola P, Lanza GA, Spinelli A, Sgueglia GA, Di Monaco A, Barone L, et al. Long-term prognosis of patients with cardiac syndrome X. Int J Cardiol 2010;140:197-9. Russo G, Di Franco A, Lamendola P, Tarzia P, Nerla R, Stazi A, et al. Lack of effect of nitrates on exercise stress test results in patients with microvascular angina. Cardiovasc Drugs Ther 2013;27:229-34. Chen JW, Lee WL, Hsu NW, Lin SJ, Ting CT, Wang SP, et al. Effects of short-term treatment of nicorandil on exercise-induced myocardial ischemia and abnormal cardiac autonomic activity in microvascular angina. Am J Cardiol 1997;80:32-8. Horinaka S. Use of nicorandil in cardiovascular disease and its optimization. Drugs 2011;71:1105-19. Denardo SJ, Wen X, Handberg EM, Bairey Merz CN, Sopko GS, Cooper-Dehoff RM, et al. Effect of phosphodiesterase type 5 inhibition on microvascular coronary dysfunction in women: A Women's Ischemia Syndrome Evaluation (WISE) ancillary study. Clin Cardiol 2011;34:483-7. Rosen SD, Lorenzoni R, Kaski JC, Foale RA, Camici PG. Effect of alpha1-adrenoceptor blockade on coronary vasodilator reserve in cardiac syndrome X. J Cardiovasc Pharmacol 1999;34:554-60. Hamilton SJ, Chew GT, Davis TM, Watts GF. Niacin improves small artery vasodilatory function and compliance in statin-treated type 2 diabetic patients. Diab Vasc Dis Res 2010;7:296-9. Palloshi A, Fragasso G, Piatti P, Monti LD, Setola E, Valsecchi G, et al. Effect of oral L-arginine on blood pressure and symptoms and endothelial function in patients with systemic hypertension, positive exercise tests, and normal coronary arteries. Am J Cardiol 2004;93:933-5. Mohri M, Shimokawa H, Hirakawa Y, Masumoto A, Takeshita A. Rho-kinase inhibition with intracoronary fasudil prevents myocardial ischemia in patients with coronary microvascular spasm. J Am Coll Cardiol 2003;41:15-9. Morimoto K, Ito S, Nakasuka K, Sekimoto S, Miyata K, Inomata M, et al. Acute effect of sodium nitroprusside on microvascular dysfunction in patients who underwent percutaneous coronary intervention for acute ST-segment elevation myocardial infarction. Int Heart J 2012;53:337-40. Schwartzkopff B, Brehm M, Mundhenke M, Strauer BE. Repair of coronary arterioles after treatment with perindopril in hypertensive heart disease. Hypertension 2000;36:220-5. Wang N, Chai W, Zhao L, Tao L, Cao W, Liu Z. Losartan increases muscle insulin delivery and rescues insulin's metabolic action during lipid infusion via microvascular recruitment. Am J Physiol Endocrinol Metab 2013;304:E538-45. Bavry AA, Handberg EM, Huo T, Lerman A, Quyyumi AA, Shufelt C, et al. Aldosterone inhibition and coronary endothelial function in women without obstructive coronary artery disease: An ancillary study of the National Heart, Lung, and Blood Institute-sponsored Women's Ischemia Syndrome Evaluation. Am Heart J 2014;167:826-32. Garg R, Rao AD, Baimas-George M, Hurwitz S, Foster C, Shah RV, et al. Mineralocorticoid receptor blockade improves coronary microvascular function in individuals with type 2 diabetes. Diabetes 2015;64:236-42. Reriani M, Raichlin E, Prasad A, Mathew V, Pumper GM, Nelson RE, et al. Long-term administration of endothelin receptor antagonist improves coronary endothelial function in patients with early atherosclerosis. Circulation 2010;122:958-66. Murdolo G, Sjöstrand M, Strindberg L, Lönnroth P, Jansson PA. The selective phosphodiesterase-5 inhibitor tadalafil induces microvascular and metabolic effects in type 2 diabetic postmenopausal females. J Clin Endocrinol Metab 2013;98:245-54. Yoo SY, Song SG, Lee JH, Shin ES, Kim JS, Park YH, et al. Efficacy of cilostazol on uncontrolled coronary vasospastic angina: A pilot study. Cardiovasc Ther 2013;31:179-85. Willoughby SR, Luu LJ, Cameron JD, Nelson AJ, Schultz CD, Worthley SG, et al. Clopidogrel improves microvascular endothelial function in subjects with stable coronary artery disease. Heart Lung Circ 2014;23:534-41. Mehta PK, Goykhman P, Thomson LE, Shufelt C, Wei J, Yang Y, et al. Ranolazine improves angina in women with evidence of myocardial ischemia but no obstructive coronary artery disease. J Am Coll Cardiol 2011;4:514-22. Tagliamonte E, Rigo F, Cirillo T, Astarita C, Quaranta G, Marinelli U, et al. Effects of ranolazine on noninvasive coronary flow reserve in patients with myocardial ischemia but without obstructive coronary artery disease. Echocardiography 2015;32:516-21. Nalbantigil S, Altintighreve A, Yilmaz H, Nalbantgil I, Onder R. The effect of trimetazidine in the treatment of microvascular angina. Int J Angiol 1999;80:40-3. Kronhaus KD, Lawson WE. Enhanced external counterpulsation is an effective treatment for syndrome X. Int J Cardiol 2009;135:256-7. Cox ID, Hann CM, Kaski JC. Low dose imipramine improves chest pain but not quality of life in patients with angina and normal coronary angiograms. Eur Heart J 1998;19:250-4.
de Vries J, Dejongste MJ, Durenkamp A, Zijlstra F, Staal MJ. The sustained benefits of long-term neurostimulation in patients with refractory chest pain and normal coronary arteries. Eur J Pain 2007;11:360-5. Sgueglia GA, Sestito A, Spinelli A, Cioni B, Infusino F, Papacci F, et al. Long-term follow-up of patients with cardiac syndrome X treated by spinal cord stimulation. Heart 2007;93:591-7. Mizuno R, Fujimoto S, Saito Y, Okamoto Y. Optimal antihypertensive level for improvement of coronary microvascular dysfunction: The lower, the better? Hypertension 2012;60:326-32. Pauly DF, Johnson BD, Anderson RD, Handberg EM, Smith KM, Cooper-DeHoff RM, et al. In women with symptoms of cardiac ischemia, nonobstructive coronary arteries, and microvascular dysfunction, angiotensin-converting enzyme inhibition is associated with improved microvascular function: A double-blind randomized study from the National Heart, Lung And Blood Institute Women's Ischemia Syndrome Evaluation (WISE). Am Heart J 2011;162:678-84. Hinoi T, Tomohiro Y, Kajiwara S, Matsuo S, Fujimoto Y, Yamamoto S, et al. Telmisartan, an angiotensin II type 1 receptor blocker, improves coronary microcirculation and insulin resistance among essential hypertensive patients without left ventricular hypertrophy. Hypertens Res 2008;31:615-22. Bavry AA, Handberg EM, Wen X, Anderson RD, Smith KM, Larman A, et al. Does angiotensin plus aldosterone inhibition improve coronary endothelial function ? An ancillary study from the NHLBI sponsored Women's Ischemia Syndrome Evaluation (WISE). J Am Coll Cardiol 2011;57 14 Suppl 1:E1047. doi :10.1016/S0735-1097(II)61047-4. Jadhav S, Ferrell W, Greer IA, Petrie JR, Cobbe SM, Sattar N. Effects of metformin on microvascular function and exercise tolerance in women with angina and normal coronary arteries: A randomized, double-blind, placebo-controlled study. J Am Coll Cardiol 2006;48:956-63. Zhang X, Li Q, Zhao J, Li X, Sun X, Yang H, et al. Effects of combination of statin and calcium channel blocker in patients with cardiac syndrome X. Coron Artery Dis 2014;25:40-4. Elliott PM, Krzyzowska-Dickinson K, Calvino R, Hann C, Kaski JC. Effect of oral aminophylline in patients with angina and normal coronary arteriograms (cardiac syndrome X). Heart 1997;77:523-6. Knuuti J, Kalliokoski R, Janatuinen T, Hannukainen J, Kalliokoski KK, Koskenvuo J, et al. Effect of estradiol-drospirenone hormone treatment on myocardial perfusion reserve in postmenopausal women with angina pectoris. Am J Cardiol 2007;99:1648-52. Gaibazzi N, Ziacchi V. Reversibility of stress-echo induced ST-segment depression by long-term oral n-3 PUFA supplementation in subjects with chest pain syndrome, normal wall motion at stress-echo and normal coronary angiogram. BMC Cardiovasc Disord 2004;4:1. Davey GC, Patil SB, O'Loughlin A, O'Brien T. Mesenchymal stem cell-based treatment for microvascular and secondary complications of diabetes mellitus. Front Endocrinol (Lausanne) 2014;5:86. Cassar A, Prasad M, Rodriguez-Porcel M, Reeder GS, Karia D, DeMaria AN, et al. Safety and efficacy of extracorporeal shock wave myocardial revascularization therapy for refractory angina pectoris. Mayo Clin Proc 2014;89:346-54.